Superheroes, video games, books, and science fiction. What’s it like to grow up in a world where Link is constantly being called Zelda? Discover the geek world as experienced and seen through a young woman’s eyes in this hilariously relatable journey, which seeks to unite and inspire all who read it via laughter inducing anecdotes, empowering stories, sentimental narratives, and SUPER geeky situations, because as we all know: the geeks will inherit the Earth. What’s life like through the eyes of a geek? Through the pages of ‘A Young Geek’s Journal’ Trilce Jiron guides readers through the trials and tribulations of geek life and has kindly joined me today for a super speedy chat about this geeky journey. Trilce, what inspired you to write about geek life? During a comic convention, Wil Wheaton was asked by an expecting mother to tell her not yet born daughter what’s it like being a geek, and why it’s so awesome. We live in a world that’s constantly judging, providing insecurities. A Young Geek’s Journal aims to provide a beacon of funny, heartfelt understanding to all those who have felt left out, weird, or simply different. Were your own weird or different experiences heavily used in this journal, or did you tend to draw more on experiences outside of your own, like this one with the expectant mother? My own life experiences were the ones that inspired every paragraph in this book. And what do you hope that readers take from the inspiration behind each and every one of these paragraphs? Being different is good, it’s amazing really. Embrace yourself and see through my eyes that we are all the same geeky, weird, loving and fun people who enjoy life to the fullest. Geeks are terribly smart people, with avid imaginations and voracious appetites for brand new worlds. Let us discover this one together. Since we don’t have much more time to share, let’s see how your imagination stacks up against a few of the quick-fire questions, designed to entice imagination in all of our guest authors. We’ll start with, if money doesn’t grow on trees then why do banks have branches? Because they’re secretly growing money on secret trees in underground bunkers. So the money trees are out there, they’re just highly controlled. Interesting. Can you cry underwater? Is crying considered the action of expelling tears or seeing them? That is the real question. Maybe the real question is do you need to have any tears to be considered to be crying? If you’re in that emotional state but are missing a great flood of tears, are you really crying? Either way, there’s more to explore here. But first, what is your favourite word? Keeping in the lovely round range of questions, why is a square meal served on round plates? Cause them squares are secret round spies. But first, if space is a vacuum, who changes the bags? Such a busy lady! What is your zodiac sign? Literally, nothing would change in the Batman story arc. Pity I was hoping he might turn into a really cool monster, but since he’s not we’re going to need to invent one. If you invented a monster what would it look like and what would you call it? Clotilde, she would be a mix between an actual dragon, not a wyvern, a unicorn, it would be furry and soft and warm when cold and hot when cold, and she would fly me to college every day. Furry, soft and awesome transit, what’s not to love? Trilce, since you’re on the move I’ll end today’s interview here, but I hope that you can continue to share your love of the geek culture with each new reader that you meet! Excited to read the book we discussed today? Find it here on Amazon: ‘A Young Geek’s Journal ( ASIN: B078RJ7L37 )‘. 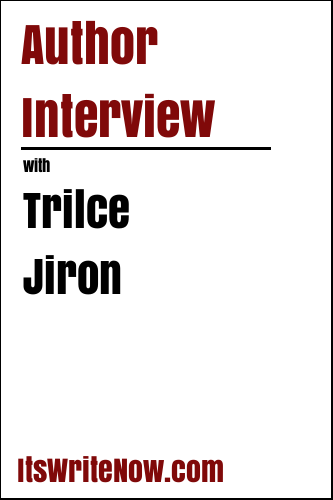 Want to find out more about Trilce Jiron? Connect here!